Sugar Eggs… have you ever made them? I have never made Sugar Eggs, but I have 3 that I set out every Easter. I love how pretty they are on the outside and the sweet Spring vignette on the inside. …and I have one that is literally 44 years old. I don’t know if the orange, yellow and green have changed all that much, but I am pretty sure that the roses did not start off brown. I love seasonal decor that has sentimental value. Do you have sugar eggs? Have you ever made them? These are so sweet and lovely and you don’t look 44 either. LOL Happy Easter! No. But now I want to. Oh my goodness does this bring back memories. My mother had some beautiful sugar eggs. I can’t believe you have have these for so long, and they still look almost perfect. I am quite sure my mother no longer has any of her sugar eggs, not because they disintegrated, but because I ate them when I was a kid. For real. Oh…I love these! My mom used to make them when I was a little girl. I only wish I still had one of her originals(and it would be a couple of years older than yours). I saw them at Cost Plus last week…just not the same as hand made from mom! I think I had one once but I can’t remember! I think they’re lovely, though. I have never made them, but remember how popular they were when I was a kid. 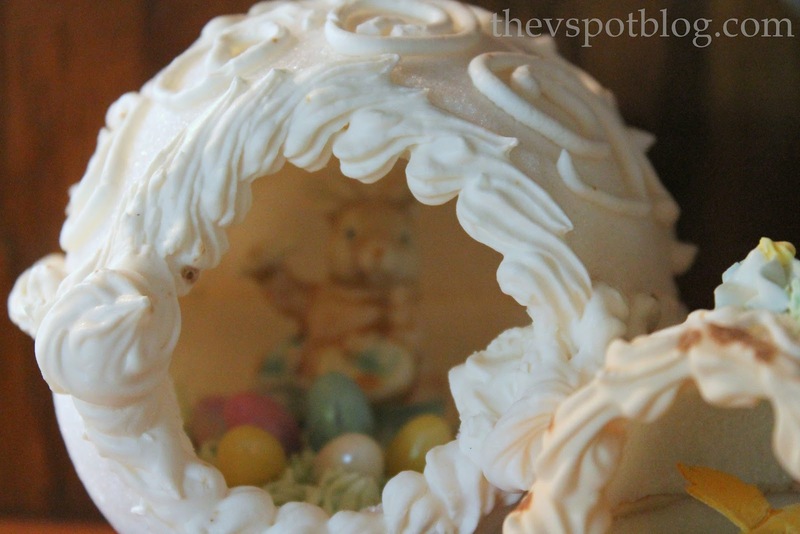 I don’t have much Easter decorations as I realized this year trying to keep up with the blog world. I’ve never made them, and I don’t even SEE them anymore – – – but we had a couple that were prominent parts of my childhood Easter memories. You figure out how to make them and then teach all of us, k? I LOVE sugar eggs, my mom has some beautiful vintage ones I may need to steal from her! Those are gorgeous. And I want to eat them….however old I really couldn’t care less. I had never seen these until a few nights ago. We had a service auction at church and someone made some of these for the auction. How awesome that you still have the one from your first Easter. I have made sugar eggs many years ago. Wilton had a kit you could buy with the recipe for the sugar and the molds. It really is not hard to do. I gave them for easter presents one year. It is a lot of fun. Getting the Easter boxes down… Easter decor ideas. Chalkboard eggs: an easy (last minute) DIY project for Easter Brunch.